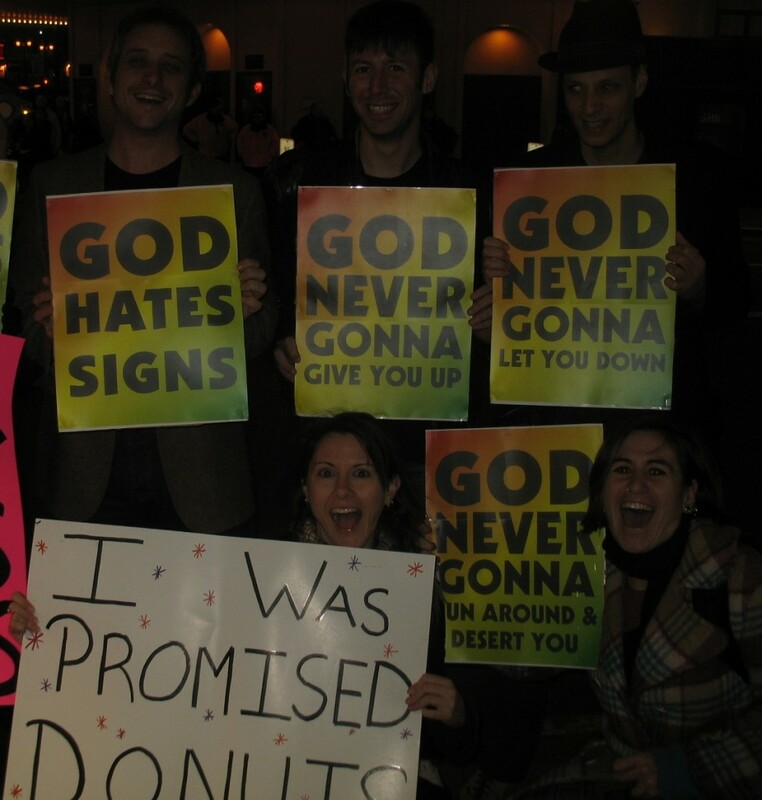 Fred Phelps and his Phuckheads picketed outside my friend’s synagogue on Rosh Hashanah. Like the staff at the JCC and LGBT shul here in NYC, who were targets last year, the rabbi in IL asked that there be no counter-protests; his advice was to ignore ignore ignore. This makes sense; if we all acted as if the Phelps phamily were invisible, they’d go away. They thrive on negative attention. If the media completely ignored them, maybe they’d take up hate-needlepoint. But this does not mean we shouldn’t use their hate toward our own nefarious homo- and Jew-loving ends. I liked the strategy of Congregation Beth Simhat Torah, the LGBT shul, when Phelps and clan protested last year. They turned the event into a fundraiser, with supporters pledging money for every minute Phelps was outside the synagogue. The Westboro bullies stayed 47 minutes; the synagogue raised $13,500. Afterward, Rabbi Sharon Kleinbaum sent Phelps a thank-you note. Ooh, burn. If Phelps’s crew picketed my kid’s day care center, a soldier or hate crime victim’s funeral in my community, a shul or JCC near me, I’d pull a Kleinbaum. But that doesn’t mean I don’t love collecting stories and pictures of the best protest signs seen at various counter-protests. They may be wrong, but they feel so right. Adolf Hitler was the best anti-Semite of ALL TIME! MAGNETS: HOW THE *?#! DO THEY WORK? Awesome, right? So on the one hand, I’m saying “Don’t do this.” On the other hand, I’m saying “This is awesome.” Life, she is full of contradictions, no? another excellent westboro protest sign! It’s about time we had some Rick-rolling, consider the level of ridiculousness this issue has achieved. Marjorie, i usually enjoy reading your stuff–started reading you originally in The Forward, but this post…I’m sorry, but you’re using restricted code. Okay, i don’t live in NYC but in Evanston IL, and I have NO CLUE to what you’re talking about here. Janice: Thanks for reading my stuff! And hm, what part of the post don’t you get? Click on the link to Fred Phelps in the first paragraph if you don’t know who he is; look up “rick-rolling” on Wikipedia if you don’t know what Goggla is referring to (the signs in the picture refer to rick-rolling, which is essentially the game/trend/meme of making people get a vintage Rick Astley song stuck in their heads). Do you believe in Yeshua? I believe there was a historical Jesus. Next post: the 7 ways your sukkah could KILL YOUR CHILD!